A permanent fort or fortified place. The Israelites, when advancing into the country west of the Jordan, found a considerable number of walled cities and fortresses which they could not conquer (Num. xiii. 28; Deut. i. 28; Josh. xiv. 12). They were compelled, therefore, to settle in open places; and when attacked they retired into forests and caves (I Sam. xiii. 6). Becoming more proficient in the art of war, they succeeded—especially in the time of the Kings—in conquering the fortresses of the Canaanites, among them Jerusalem. David fortified the captured city anew, i.e., the socalled "city of David," on the steep eastern hill (II Sam. v. 9; I Kings iii. 1, ix. 15, xi. 27). According to II Chron. xxxii. 5, xxxiii. 14, Hezekiah and Manasseh were the first to surround with a wall the rest of the city also. Later the Maccabeans and Herodians built a third wall around it on the north and northwest. The Israelites built new fortresses ("mibẓar," "ḳiryah beẓurah," "ḳiryat 'oz") after the pattern of the Canaanite fortresses, especially for the protection of the frontiers and the approaches to the country. Thus Solomon erected Hazor and Megiddo as a protection against enemies from the northeast; Gezer, Beth-horon, and Baalath against those from the coast on the west; and Tadmor (Tamar) against those from Idumea (I Kings ix. 15, 17 et seq.). Asa fortified Geba and Mizpah against the northern kingdom (I Kings xv. 21 et seq.). According to II Chron. xi. 5 et seq., Rehoboam fortified fifteen cities to the south and west of Jerusalem as a protection against Egypt. 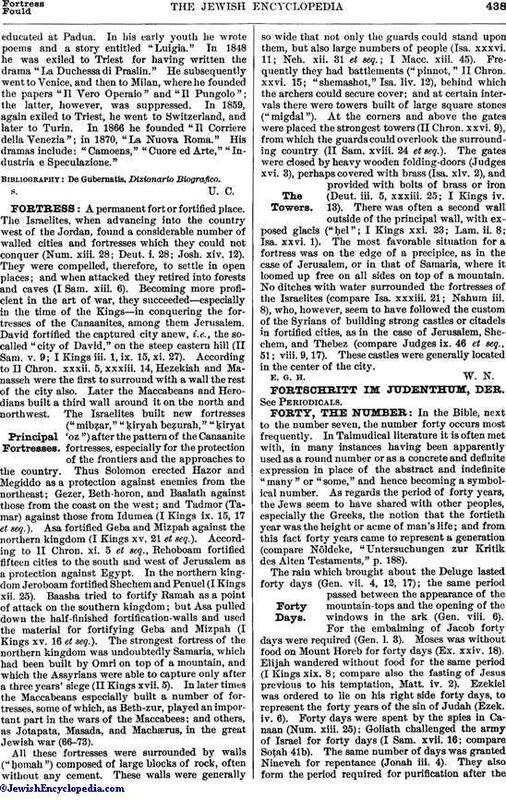 In the northern kingdom Jeroboam fortified Shechem and Penuel (I Kings xii. 25). Baasha tried to fortify Ramah as a point of attack on the southern kingdom; but Asa pulled down the half-finished fortification-walls and used the material for fortifying Geba and Mizpah (I Kings xv. 16 et seq.). The strongest fortress of the northern kingdom was undoubtedly Samaria, which had been built by Omri on top of a mountain, and which the Assyrians were able to capture only after a three years' siege (II Kings xvii. 5). In later times the Maccabeans especially built a number of fortresses, some of which, as Beth-zur, played an important part in the wars of the Maccabees; and others, as Jotapata, Masada, and Machærus, in the great Jewish war (66-73). All these fortresses were surrounded by walls ("ḥomah") composed of large blocks of rock, often without any cement. These walls were generally so wide that not only the guards could stand upon them, but also large numbers of people (Isa. xxxvi. 11; Neh. xii. 31 et seq. ; I Macc. xiii. 45). Frequently they had battlements ("pinnot," II Chron. xxvi. 15; "shemashot," Isa. liv. 12), behind which the archers could secure cover; and at certain intervals there were towers built of large square stones ("migdal"). At the corners and above the gates were placed the strongest towers (II Chron. xxvi. 9), from which the guards could overlook the surrounding country (II Sam. xviii. 24 et seq.). The gates were closed by heavy wooden folding-doors (Judges xvi. 3), perhaps covered with brass (Isa. xlv. 2), and provided with bolts of brass or iron (Deut. iii. 5, xxxiii. 25; I Kings iv. 13). There was often a second wall outside of the principal wall, with exposed glacis ("ḥel"; I Kings xxi. 23; Lam. ii. 8; Isa. xxvi. 1). The most favorable situation for a fortress was on the edge of a precipice, as in the case of Jerusalem, or in that of Samaria, where it loomed up free on all sides on top of a mountain. No ditches with water surrounded the fortresses of the Israelites (compare Isa. xxxiii. 21; Nahum iii. 8), who, however, seem to have followed the custom of the Syrians of building strong castles or citadels in fortified cities, as in the case of Jerusalem, Shechem, and Thebez (compare Judges ix. 46 et seq., 51; viii. 9, 17). These castles were generally located in the center of the city.